Fitness brand is promoting its new Versa Lite smartwatch. 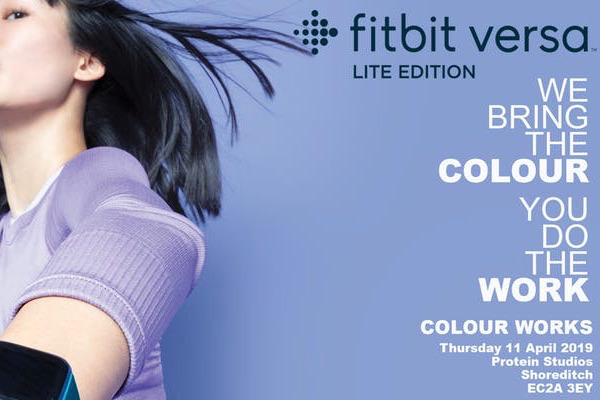 Fitbit is running a one-day event next month with intensive workouts and chilled yoga sessions to promote its new Versa Lite smartwatch. The "Colour works" activation will take place on 11 April at Protein Studios in Shoreditch, London. Fitbit will host four 15-minute "power" workouts at the venue led by its physical trainers, brand ambassador London Fitness Guy and movement artist Paleta CalmQuality. The studio will be "flooded with colour" for a "truly immersive sensory experience". There will be different themed areas, such as the scarlet HIIT zone and the lilac yoga cocoon.